In my first PreJury, we firstly had our main design idea of producing a proposition of a house that is being designed and critiqued by the set of references and quotations that govern that building. We also produced our main design diagrams and drawings that explained our thought process visually. The thoughtfully produced further analysis on our references and the scaled drawings of them helped us grasp the idea behind designs and hopefully notice and analyze new qualities and spatial experiences that was not specifically mentioned by the architects themselves. Also because we are students, discovering and understanding the technical drawings and diagrams helped us improve our designs and also take reference the way real-world architects design things as well as the designs themselves. In my jury, I showed how I integrated my previous idea and how I changed my first idea of referencing the vertical circulation volume of stairs that are in the Fukuta house. I first produced my main element of the slanted surface for having a reference place for the insertion of the volumes also referencing Fukuta house. But I noticed that this volumetric formation was very suitable for the slanted surface of the hill. This creates a point that the big surface is the projected abstraction of the ground surface. After the insertion, I anticipated that these volumes became intertwined and rotated to change their direction this later allowed me to use the analysis gathered from the Tolo house which is very modular and formed in a path that goes down a hill’s slope. Then I added my quote from this house which is the tilted bedroom formation allowing for a private way of passing through the house. But in my jury, we noticed that the big slanted roof was not functioning spatially, therefore, being kind of an ornament. The Tolo house reference and the Fukuta house reference were working properly but not fully integrated with each other. I could further study and try three main approaches that could solve this. One is improving the Fukuta house reference by improving the spacial quality if the slanted surface to use it to solve my problems. Another one is to eliminate the slanted roof, choose the Tolo house reference or the last one can be connecting them through the middle space that is being produced by the angle of turning of the house as a path idea. In our project for a design that deals with how to translate our design and compositional skills that we have gained from our first year studio into something that is established from a real life field where the designs are no longer existing in a hypothetical space and the site is observable in real life, we visited Meke Maar as our topography for intervention. 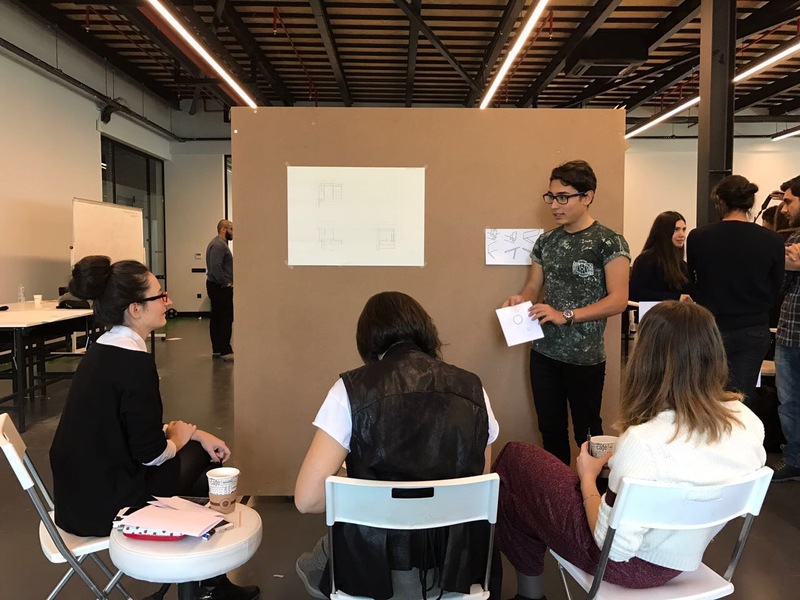 This semester of our second-year studio deals with how to enrich the experiences that are present in this volcanic formation with the inspiration and the information that transforms into forms and themes from Çatalhöyük and Taşkale. This involves the study of human scale and the scale of the overall design that are evident in the site. This process allows me to see the part of the design process reflected to the real life examples of spaces and how they are formed. Even though the function of these constructs is absent, in this case, their function is to only make the experience of these people more enhanced. My jury mostly involved the critics that the jury members directed towards me to create a discussing medium that allows me to further develop the project. My biggest critique was the sudden end of the design when encountered with a barrier. While I am trying to construct an “artificial landscape” that transitions into a singular space that is defined away from the topography, this sudden end is not evident in the field and is not naturally made. Nothing in nature ends in a climax point. There is always a dissolving afterward that make the process end somehow but in a suitable way. Also after the jury, I needed to consider the reason why I choose that particular area with respect to the other parts that suit my analysis of enclosure levels. After some thought, I noticed that my area was the only one where the transition from a high enclosure level to a common openness was present in a linear manner that could allow me to study this condition sequentially. In the jury, I became aware that my design did not consider the whole topography for the experience of this particular area. After the jury, I tried to solve this problem by making the path in a curvilinear way to always experience the perimeter of the main crater mountain. Designing this poster was definitely a learning experience for me. First of all, I had to learn the proper way to read a poster in an architectural way. The positioning of the elements should be in a logical way. A poster is read from left to right and therefore the chronological order of my jury presentation should also be implemented to the overall organization on my poster. A poster should be self-explanatory and should represent the design process.